Is your cat bored? It can be hard to tell, since cats spend so much of their time sleeping anyway. However, if you’ve lately noticed your cat intentionally messing with things that he knows aren’t his toys, grooming excessively or participating in odd obsessive behaviors, boredom could be the cause. You may also notice your cat sleeping even more than usual or overeating. 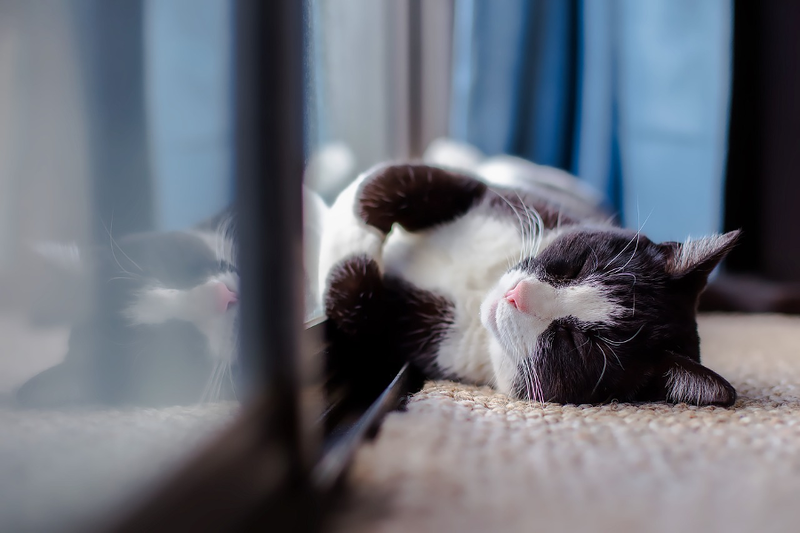 If you see these signs, here are some things you can do to prevent cat boredom and help keep your cat happy and entertained. Get another cat. Easier said than done, right? But it’s true that having 2 cats means they always have someone to play with, even if you’re out of town. They can chase each other, explore new boxes and under-bed spots together, and even nap together. Provide a variety of scratching posts. Cardboard horizontal scratchers are great because they make adding catnip to them easy. Sprinkle some in and watch your cats suddenly become much more interested in that post than they had been. Vertical posts often come with a dangling toy attached, which is helpful as well for entertainment. Provide view spots: whether it’s lying on the dining room table or in a window sill, allow spots for your pets to view the outside world. They’ll stay entertained by bugs, birds, and even trees blowing in the wind. Finally, there are lots of easy ways you can help your cats stay entertained around the house – when you get a new piece of furniture or a package, save the box and turn it into a cat palace for a day or two. Throw empty toilet paper rolls down and watch your cats chase them. Hide their treats around the house for them to hunt and find. Remember too that, even though they don’t seem like it sometimes, cats need cuddle time with their owners. Find time to interact with your cat and he’ll be a happier feline!